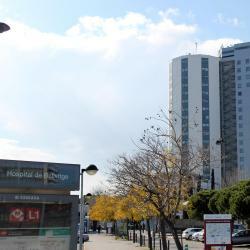 Looking for hotels near Bellvitge Metro Station? Hesperia Barcelona Fira Suites is located in the Fira business district in the outskirts of Barcelona, with direct metro links to the center. Located in Plaza Europa in Hospitalet de Llobregat, this apartment features a terrace with city views. The apartment is 984 feet from Gran Vía 2 Shopping Center. This futuristic tower is set between Barcelona city center, 15 minutes' drive away, and the airport, 5 minutes' drive away. Located opposite Fira Barcelona Exhibition Center, Porta Fira is an impressive red tower designed by Japanese architect Toyo Ito. Renaissance Barcelona Fira Hotel is conveniently located in Plaza Europa Square, next to the Fira Barcelona Convention Center. A 6-minute walk from Plaza Europa, Apartment Plaza Europa is located in the Barcelona Fira 2 district of Hospitalet de Llobregat. This design hotel is just 492 feet from Plaça Espanya and opposite Las Arenas Shopping Center. It has an 8th-floor swimming pool and sun terrace with spectacular views of Montjuic. It's very convenient place to go around with subway and airport buses. Sofia GL is set on Barcelona's Diagonal Avenue, a 5-minute walk from FC Barcelona’s Camp Nou Stadium. It features free WiFi throughout, on-site restaurants and stunning city views. The service is great! Staffs are very helpful. Located in Barcelona, a 15-minute walk from Camp Nou, Ona Hotels Arya has a terrace. This 3-star hotel offers a bar. Magic Fountain of Montjuic is 1.5 miles from the hotel. Location is fabulous. The staff were courteous and the place was beautiful and spotlessly clean. Located in Barcelona’s Pedralbes neighborhood, Upper Diagonal offers modern accommodations with free WiFi and a gym just 0.6 mi from the Camp Nou football stadium. The room was spacious and clean. It is 5 mins walking to Maria Christina Metro station. Offering a heated rooftop pool with a large sun terrace, TWO Hotel Barcelona by Axel is located in the heart of the gay district of Barcelona, 1.2 mi from Barceloneta Beach. Clean, modern and staff was very friendly! Highly recommend! SmartRoom Barcelona is an eco-friendly economy hotel located in central Barcelona, 0.6 mi from Sants Train Station. The hotel has excellent location. 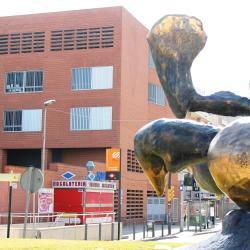 Few stations away from Plaza de Catalunya and majpr attractions. Located just 5 minutes’ walk from Barcelona’s Fira 2 Convention Center, Hotel SB Plaza Europa offers air-conditioned rooms with free Wi-Fi. Very good environments and equipment. Staff are passion and reliable. Just 100 yards from Cornellà’s Fira Exhibition Center, the modern Ibis Cornellà offers air-conditioned rooms with flat-screen satellite TV. It has free on-site parking and a 24-hour bar. Multilingual staff, friendliness, value for money. The Ayre Hotel Gran Via is a modern design hotel with a bright central courtyard. It offers free Wi-Fi and a convenient location, next to Barcelona’s Plaça Espanya. Room is super clean, even if it’s in a busy street. You wont here any noise from the outside. Offering a rooftop pool and terrace, NH Collection Barcelona Constanza has modern rooms with satellite TV. The staff all restaurant and reception excellent esp. This modern hotel is located close to Barcelona El Prat Airport. It offers a free airport shuttle, shuttle to the Ramblas for an extra charge, and a seasonal swimming pool. The staff was excellent and extremely friendly! They were very accommodating! Hotels with great access to Bellvitge Metro Station! The stylish Catalonia Rigoletto is set 1640 feet from FC Barça’s Camp Nou stadium and 5 minutes’ walk from Maria Cristina Metro Station. Staff is very helpful but like all of spain slow to respond by my standards. Extremely kind people. Beautiful and stylish suites located in the heart of Pedralbes, one of the top residential areas of Barcelona and close to one of the city's main business districts. Excellent hotel. Comfortable and clean rooms, convenient location and super helpful staff. Located in Barcelona’s Plaza España, Hotel Catalonia Barcelona Plaza has a seasonal rooftop pool and terrace with 360º views of the city. It offers a fitness room, beauty salon and free WiFi. only a wonderful place to be !!!!! This comfortable hotel is located next to Sants AVE Train Station and offers panoramic views of Barcelona. Gran Hotel Torre Catalunya has a bar for exclusive use of the guests. Location was great for returning the rent a car. Easy walk. From train station. Set just off Gran Vía and a 2-minute walk from Plaza Espanya Metro Station and the Fira Exhibition Center, Ofelias Hotel offers stylish rooms with free Wi-Fi. Location! 5 minute walk of of Plaza Espana but in a quiet residential street. H10 Itaca is within 10 minutes’ walk of Sants Train Station, the AVE High-Speed Railway, Plaza España and the FIRA Exhibition Center. It features a stylish 2297 ft² terrace with a plunge pool. We absolutely loved the location ! Pretty much everything we needed was in walking distance.